The hot gas in the galaxy cluster Abell 2052 is being sloshed back and forth like wine in a glass. The sloshing was set in motion when a small cluster smashed into the larger central one. 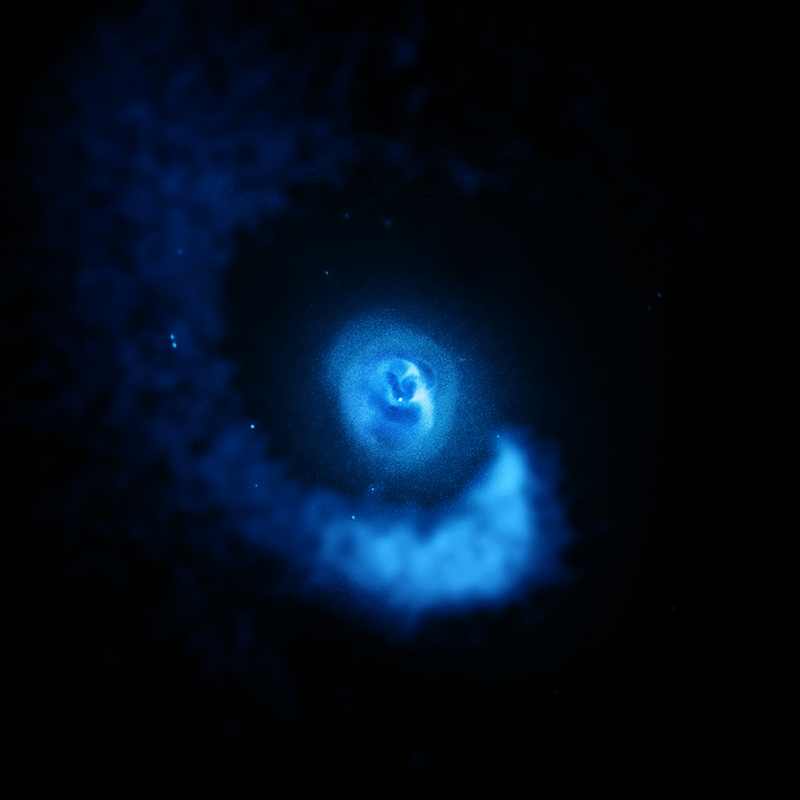 The large spiral structure on the outside of the image was also caused by that off center collision. Sloshing of hot gas like this can affect how the giant elliptical galaxy and its supermassive black hole at the center grow. Like wine in a glass, vast clouds of hot gas are sloshing back and forth in Abell 2052, a galaxy cluster located about 480 million light years from Earth. X-ray data (blue) from NASA's Chandra X-ray Observatory shows the hot gas in this dynamic system, and optical data (gold) from the Very Large Telescope shows the galaxies. The hot, X-ray bright gas has an average temperature of about 30 million degrees. A huge spiral structure in the hot gas - spanning almost a million light years - is seen around the outside of the image, surrounding a giant elliptical galaxy at the center. This spiral was created when a small cluster of galaxies smashed into a larger one that surrounds the central elliptical galaxy. As the smaller cluster approached, the dense hot gas of the central cluster was attracted to it by gravity. After the smaller cluster passed the cluster core, the direction of motion of the cluster gas reversed and it traveled back towards the cluster center. The cluster gas moved through the center again and "sloshed" back and forth, similar to wine sloshing in a glass that was jerked sideways. The sides of the glass push the wine back to the center, whereas in the cluster the gravitational force of the matter in the clusters pulls it back. The sloshing gas ended up in a spiral pattern because the collision between the two clusters was off-center. 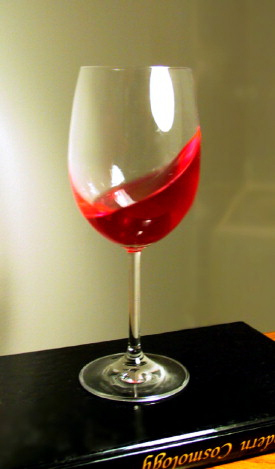 Wine sloshing backwards and forwards in a glass provides a small-scale analogy to hot gas sloshing backwards and forwards, over vast scales, in a galaxy cluster. This type of sloshing in Abell 2052 has important physical implications. First, it helps push some of the more dense, cooler gas located in the center of the cluster -- where temperatures are only about 10 million degrees -- farther away from the core. This helps prevent further cooling of this gas in the core and could limit the amount of new stars being formed in the central galaxy. Sloshing motions like those seen in Abell 2052 also redistribute heavy elements, like iron and oxygen, which are forged in supernova explosions. These elements are used in the future generations of stars and planets and are necessary for life as we know it. Chandra's observation of Abell 2052 was particularly long, lasting more than a week. Such a deep observation was necessary to detect all of the details in this image. Even then, processing to emphasize more subtle features was necessary to reveal the outer spiral structure. In addition to the large-scale spiral feature, the deep Chandra observation reveals exquisite detail in the cluster center related to outbursts from the central supermassive black hole. The Chandra data show clear bubbles evacuated by material blasted away from the black hole, which are surrounded by dense, bright, cool rims. As with the sloshing, this activity helps prevent cooling of the gas in the cluster's core, setting limits on the growth of the giant elliptical galaxy and its supermassive black hole. These results were published in the August 20, 2011 issue of The Astrophysical Journal. The authors were Elizabeth Blanton of Boston University, Boston, MA; Scott Randall of the Harvard-Smithsonian Center for Astrophysics in Cambridge, MA; Tracy Clarke of the Naval Research Laboratory in Washington DC; Craig Sarazin of the University of Virginia in Charlottesville, VA; Brian McNamara of the University of Waterloo in Waterloo, Canada; Edmund Douglass of Boston University and Michael McDonald of the University of Maryland, College Park, MD. Coordinates (J2000) RA 15h 16m 44.40s | Dec +07° 01´ 20.00"
Can you please let me know the total baryonic mass of Abell 2052? Can I purchase a photo of this image? My cousin, Dr. Leon VanSpeybroeck, was instrumental in building the Chandra telescope and I want to buy the images taken on the dates closest to my grandsons birthdays, February 15, 2011 and December 5, 2011 and December 5, 2012. The picture, in my opinion, hint a different interpretation: we are looking inside a spiral jet whose core AGN is inside the cluster center..the image in large scale remind the probable behavior of GRB whose precessing jets are sometimes blazing the observer as rapid flare..
A pulsar found within a supernova remnant in the Small Magellanic Cloud (SMC). 180,000 light years from Earth. Data from NASA's Chandra X-ray Observatory and ESA's XMM-Newton have been combined with optical data from the Cerro Tololo Inter-American Observatory. 1.27 million light years across. X-rays are blue and the optical data is red and green. In the constellation Tucana in the Southern Hemisphere.